A perfect weekend getaway in the magical city of Krakow. 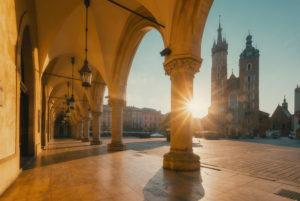 Even if you cannot stay longer than 2 or 3 nights, you will relish the old town and get to explore two of its important neighbors: the gruesome reminder of Poland’s wartime past, Auschwitz, and the marvelous medieval Wieliczka Salt Mine. We will check you into an ideal hotel that suits your preferences. There are more than 200 hotels in Krakow, many good and even superb: both in midrange and superior categories. Some of the hotels are in 15th or 16th century palaces and their rooms with original frescoes and stuccowork come at prices 50-70% lower than in similar establishments in the Renaissance towns of the Southern Europe. Plan your Krakow city break with the exclusive support of our Personal Travel Assistants. We will pick the deals according to your wish list. Here are some examples of 2-4 night stays in Krakow (the prices are given for high season, October-April up to 30% off). Contact us if you prefer something different. choose the dates to visit Krakow. contact us for a quote on all the services you have selected. we will personally advise, book restaurant tables and plan culture events. all your arrangements in Krakow will be confirmed (in case of any problems, call our 24/7 phone helpline). To learn more about our exclusive services (Tailor-made tours including city breaks), please visit the Q & A page.